Caraway seeds are best known as the distinctive flavoring agent in rye bread, but their usefulness actually goes much further. Caraway seeds have been with us literally since the Stone Age: archaeologists working in Europe have postively identified caraway seeds in the middens (wastage pits) of pre-agricultural hunter-gatherers . When you consider caraway seed oil’s benefits in stimulating digestion and appetite as well as treating indigestion and gas , it’s no wonder our pre-modern ancestors made room for it in their diets. The caraway plant (Carum carvi) belongs to the same family as the carrot and fennel, with similar thread-like, feathery leaves and white or pink flowers that grow in an umbrella-shaped cluster . It is native to Europe, North Africa and West Asia as far east as India; some scholars have suggested the name caraway dervies from the Sanskrit term for the seeds, caravi. Caraway seeds—which aren’t actually seeds but achenes, dry crescent-shaped fruits —have been used to flavor various cuisines in ancient Rome, and in Europe and the Middle East since medieval times. Though we usually associate caraway’s sharp licorice flavor with savory dishes, one popular dessert during Muslim Ramadan is sweet caraway seed pudding. Caraway seeds have remained especially popular in Germany, where they’re used to add a sweet-spicy hint to everything from rye bread to meats, aged cheeses, and pickles. There’s even a type of German brandy called Kümmel that is flavored with caraway seeds! Over time, magical properties and folk beliefs also became attached to caraway seeds: in medieval Germany and other parts of Europe, caraway seeds were used in spells to protect children from harm. Other beliefs held that caraway seeds could be placed with valuables to prevent theft, and that the seeds worked as a charm to prevent lovers from losing interest in one another. Therapeutically speaking, caraway seed essential oil is primarily used to stimulate appetite and ease digestion, especially when someone is suffering from gas, bloating, or constipation . Caraway seed oil’s antispasmodic action on intestinal cramps and stomach upset make this oil a natural choice at times when overeating or indigestion causes discomfort. 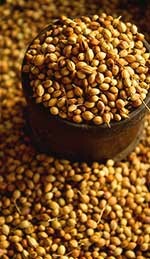 Applied topically, caraway seed oil may also be helpful in regulating oily skin . Its sharp, licorice-like scent is thought to relieve mental and emotional fatigue and have expectorant properties , making caraway seed oil a great complementary therapy for people suffering the winter doldrums or the aftereffects of a cold. Fans of fennel and anise essential oil’s fruity camphoraceous scent and energizing aura will find a lot to like in caraway seed oil! 1. Bull, HF and E Bull. Some Account of the Blackmore Museum. 1868. Devizes: Wiltshire Archaeological and Natural History Society. 2. Wong, Cathy, ND. “Caraway – What Should I Know About It?” Altmedicine. Last modified August 2nd, 2013. http://altmedicine.about.com/od/herbsupplementguide/a/Caraway.htm. 3. “Caraway”. Wikipedia. Last Modified June 3rd, 2014. http://en.wikipedia.org/wiki/Caraway. 4. Stratford, Sarah Jane. 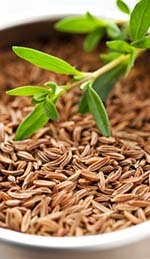 “Caraway Seeds in Skin Care”. Love to Know: Skincare. Accessed June 9th, 2014. http://skincare.lovetoknow.com/Caraway_Seeds_in_Skin_Care. 5. “Aromatherapy: Caraway (Carum carvi)”. Herbs2000. 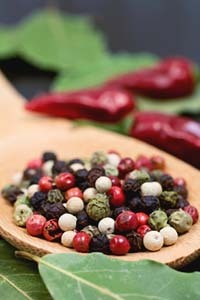 Accessed June 9th, 2014. http://www.herbs2000.com/aromatherapy/a_caraway.htm. This entry was posted in Aromatherapy, Essential Oils and tagged essential oil for indigestion on September 15, 2013 by Keith Cleversley. Named for its distinctive star-shaped seed pod, star anise has been used as a cooking spice and medicine in East and Southeast Asia for hundreds of years, especially in the treatment of digestive disorders such as upset stomach and wind . Star anise essential oil is clear to pale yellow with a strong licorice-like odor reminiscent of anise seed oil, although the two species are not closely related. Its familiar aroma comes from the presence of anethole, a compound with beneficial regulating properties for the digestive system . 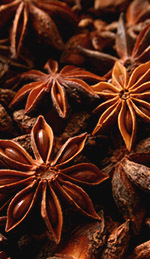 The star anise (Illicium verum) is a small evergreen tree native to Southwest China and Northeast Vietnam. The genus name Illicium comes from the Latin verb illicio, meaning to entice, because star anise’s sweet-spicy flavor was believed to attract anyone who smelled it. Not surprisingly, star anise seed pods are popular in East, South and Southeast Asian cooking, especially in Vietnam, Malaysia, and Indonesia. 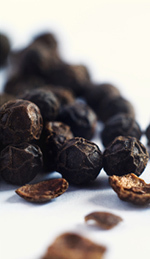 Star anise seed pods add dimension to Chinese Five Spice, Indian garam masala and biryani rice, and Vietnamese phò noodle soup. In the West, star anise seeds are often used as a more economical alternative to anise seed for flavoring baked goods and liqueurs such as Anisette. In traditional Chinese medicine, star anise is considered a warming and moving herb that is stimulating to the stomach, spleen, gall bladder and liver . Star anise essential oil and star anise tea were used to treat ailments resulting from blockages in these systems. Star anise seeds were chewed after meals in China and Japan to sweeten the breath and aid digestion, and the tea made from the seeds was sometimes employed against rheumatism. Today, aromatherapists use star anise essential oil in massages to treat indigestion, colic and gas, rheumatism, and menstrual cramps . Star anise oil may also be diffused and inhaled to treat congestion, persistent coughs, colds and chills, to relieve mental fatigue, and to balance the emotions . Interestingly, traditional and modern medicine also cross paths in the star anise tree: star anise seed pods are the main commercial source of shikimic acid, a precursor of the drug oseltamivir (Tamiflu), which is used to treat influenza . Shikimic acid is extracted from star anise seeds in a 10-stage process that takes a year to complete! While star anise seeds are safe for human consumption, the seeds of a related species, Illicium anisatum, are toxic: native to Japan, this species contains the neurotoxic compounds anisatin, neoanisatin, and pseudoanisatin, which can also cause inflammation of the kidneys and digestive tract if the seeds are consumed . Illicium anisatum seeds were once burned as a ceremonial incense in Japan, but today it is recommended to avoid using this species in any application. Always buy your star anise essential oil from a reputable vendor that lists the genus and species (Illicium verum) on the label to make sure you are getting a true, verified star anise essential oil. 1. Lawless, Julia. 1995. The Illustrated Encyclopedia of Essential Oils. Rockport, MA: Element Books, 61-66. 2. Pujar, A. “Pathway: t-anethole biosynthesis”. MetaCyc. Last modified March 3rd, 2010. http://biocyc.org/META/NEW-IMAGE?type=PATHWAY&object=PWY-5867. 3. “Illicium verum– Medicinal Uses” Wikipedia. Last modified June 8th, 2014. http://en.wikipedia.org/wiki/Illicium_verum#Medicinal_uses. 4. Ali, Naheed Shoukat. “Star Anise Perfume Ingredient: Illicium verum“. Fragrantica. Accessed June 17th, 2014. http://www.fragrantica.com/notes/Star-Anise-100.html. 5. Wang, G.W., WT Hu, BK Huang, LP Qin. 2011. “Illicium verum: a review on its botany, traditional use, chemistry, and pharmacology.” Journal of Ethnopharmacology 136 (1): 10-20. This entry was posted in Aromatherapy, Essential Oils and tagged essential oil for indigestion on August 9, 2013 by Keith Cleversley.